Credit: Dave Herholz on Flickr, under Creative Commons (CC BY-SA 2.0). (WOMENSENEWS)–The word "doula" originates from a Greek word meaning "woman helper" or "slave." In 1973, an anthropologist named Dana Raphael used the term in a study where she discussed the history of women (traditionally family mem­bers) supporting one another during childbirth. Later, clinical trials conduct­ed by Marshall Klaus and John Kennell showed that the simple presence of another woman (even if she was sitting quietly alongside a birthing mother) improved birth outcomes, reduced C-section rates and improved maternal satisfaction. The role has since become more popular as people have responded to the challenges of our hospital-based maternity care system by inviting support people to join them during labor and delivery. Activists saw an urgent need for doulas because of the medicalization of pregnancy and childbirth, its move from the home to the hospital and the challenging conditions present in hospital settings in the U.S. Having a trained emotional support person provided the reinforcement that family members could no longer offer, initially because they weren’t allowed to be in the room, and later because they lacked the knowledge about pregnancy and birth. Doulas are an intervention into the gaps left by our current maternity care system. These gaps aren’t always due to negligence; sometimes they are sim­ply an issue of capacity. Labor and delivery nurses now manage multiple pa­tients at a time. Continuous and uninterrupted support is literally impossible for most nurses, doctors and even midwives working in hospital settings. It wasn’t until 1992 that Doulas of North America (DONA), one of the first doula training and certifying organizations, was founded. By 1994 DONA had certified 750 doulas and 10 years later that number reached 5,842. It’s a stun­ning increase that reflects the growth and emerging popularity of the role. In June 2011, the Oxford English Dictionary officially added the word "doula," defining it as "a woman who gives assistance and advice to a new or expectant mother, either informally or professionally; esp. a woman (typically without for­mal obstetric training) employed to provide guidance and continuous support during labour." It’s important to remember that although the term and its use in the English language are new, the concept of pregnant people having support from family or community members is not. It’s likely as old as childbirth itself. We all come to this work for different reasons. Until recently, most of the doulas I encountered were parents themselves–their childbirth experience, whether positive or negative, inspired them to serve others during pregnancy and childbirth. I often get comments and emails with questions about how I can be both an abortion doula and a birth doula–aren’t those two things a contradiction? I always reply that the answer is definitely no. The common thread throughout all these experiences, and all the ways in which I apply my skills as a doula, is unconditional and nonjudgmental support. That is the essence of doula work. It is not our work to encourage pregnant people to birth naturally or dis­courage them from having C-sections. It is not our work to counsel them on medical decisions. It is our work to provide support through whatever choices they make, ensuring they have the best possible experience. That doesn’t mean we can’t suggest things, point people to further reading or answer questions. But many doulas have an agenda. Many doulas will only work with certain kinds of people, during certain kinds of births. While I believe it is your obligation to say no to doula work in which you wouldn’t be able to be nonjudgmental, I also think that having an agenda is contrary to the mission of doula work. A few years after launching my blog Radical Doula, I got an email from a woman in Minnesota. She was looking for a doula, she told me, and had been turned down by three different doulas already. The first doula turned her down be­cause she wanted to keep open the possibility of an epidural during labor. The second doula turned her down because she’d decided to do a selective termination when she realized she was pregnant with twins but only wanted one child. The third doula turned her down because she was serving as the surrogate for a gay male couple. She eventually found a doula, but her story highlights just how alienating a doula’s agenda can be. Miriam Zoila Pérez is a writer, activist and trained doula. 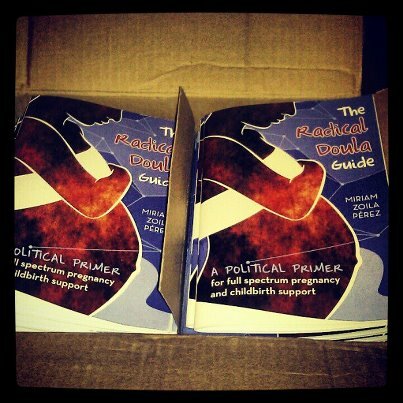 She’s the founder of RadicalDoula.com, a blog about the connections between birth activism and social justice, and the author of "The Radical Doula Guide." Find out more about Pérez and her work.